This French/Italian sword 'n' sandal effort is set in the Rome of 476 BC. 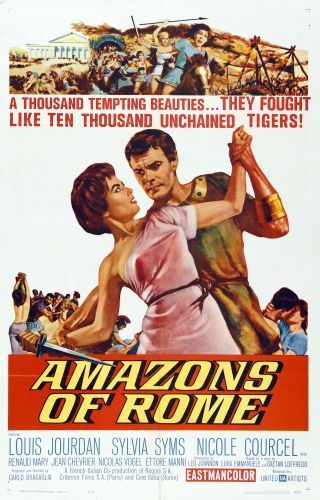 The Eternal City is threatened with invasion from the Etruscans, with soldier-of-fortune Louis Jourdan in the vanguard. When offered a truce, Jourdan demands that the Romans offer hostages as a sign of good faith. He is especially interested in making the acquaintance of Sylvia Sims, the militaristic leader of a group of female warriors (the "Amazons" of the title). As the film hastens to its conclusion, we learn that Jourdan and Syms are the only honorable people around; with plenty of treachery and back-stabbing in both the Roman and Estrucan camps, it's a wonder if anyone will be left standing for the final battle scenes.